The "Heritage Series GJK 3 Stainless Steel Gas Grills" is a new line of high performance grills built for a lifetime and loaded with unmatched features. The "Heritage Series GJK 3 Stainless Steel Grill" is tougher than all outdoors... no matter how tough the weather is! Leave it out all year 'round. 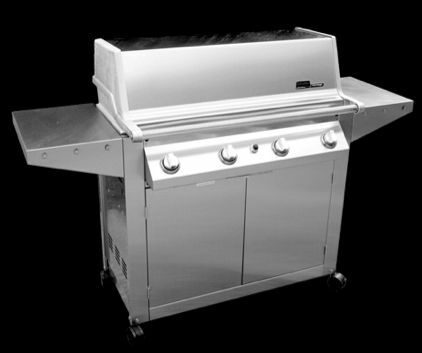 With a "Heritage Series GJK 3 Stainless Steel Grill" there's virtually NO maintenance! The whole unit, inside and out, and exposed Metal parts are made of stainless steel or aluminum, that's weatherproof. Every component from the rugged grill head, solid cart to the stainless steel fasteners, is engineered to work and built to last. The patented Hi-Temp burner technology, the functional positioning of the components and the exclusive self-cleaning Flavor Master porcelain briquettes combine to give the GJK 3 uniform heat distribution and unmatched cooking performance.